•	Monetary easing should be maintained as planned until inflation is durably above the 2% target, while closely monitoring costs and risks. •	Financial supervisors should encourage financial institutions to improve their risk management in areas where they have increased their risk-taking. •	Abolish the right of firms to set a mandatory retirement age and reinforce legislation against age discrimination. •	Strictly enforce the new 360-hour annual limit on overtime hours and raise penalties on firms that exceed it. Introduce a mandatory minimum period of rest between periods of work. •	Focus on reducing the waiting list for childcare so that mothers are not forced to leave the work force and strengthen measures to prevent discrimination against women in education and employment. •	Provide programmes to help foreign nationals adjust to Japan, including through education, and ensure fair treatment in wages and conditions to attract foreign workers. to encourage firms to use large cash holdings for investment, increase diversity on corporate boards and reduce crossshareholding. •	Encourage mergers, acquisitions and divestitures of SMEs in the face of labour shortages to promote consolidation of managerial resources in viable firms. •	Develop a comprehensive fiscal consolidation plan covering specific spending cuts and tax increases, including a further gradual rise of the consumption tax, to ensure fiscal sustainability. •	Take long-term care out of hospitals and shift its focus to home-based care. Promote greater use of generic drugs by making them the standard for reimbursement by health insurance and raise the co-payment rate of the elderly by establishing the ability-to-pay principle through an effective system for assessing income and assets. •	Promote the joint provision of local public services and infrastructure across jurisdictions and the development of compact cities. •	Raise the pension eligibility age above 65 to maintain a sufficiently high replacement rate, while taking measures to expand the employment of older persons. Remove distortions in tax and social benefit systems, such as the spousal deduction, that discourage labour force participation, while increasing the coverage of firm-based social insurance. •	Develop a low greenhouse gas emission development strategy with a horizon to 2050. •	Strengthen competition in electricity markets by ensuring that the transmission systems operator is fully independent from the vertically integrated incumbent utilities and expand interconnection capacity. •	Gradually increase the effective carbon price, while taking account of the social and economic impact. Growth has strenghtened but Japan faces longterm challenges Japan’s current economic expansion is its longest of the post-war era. The growth of output per capita has accelerated since 2012 to a rate close to the OECD area (Figure A), supported by the three arrows of Abenomics — a bold monetary policy, flexible fiscal policy and structural reforms. Persistent deflation has ended and the government budget deficit has fallen from 8.3% of GDP in 2012 to 2.4%. Japan faces the intertwined challenges of rapid population ageing and high government debt. Ageing is partly driven by long life expectancy. Half of the children born in Japan in 2007 are expected to live to the age of 107, which has major implications for the labour market. The number of elderly is projected to rise from 50% of the working-age population in 2015 to 79% by 2050, remaining the highest in the OECD (Figure B). The increasing elderly population has driven a sharp rise in social spending since 1992. Twenty-seven consecutive years of budget deficits have driven gross government debt to 226% of GDP in 2018, the highest ever recorded in the OECD area. The government projects that population ageing will boost spending on health and long-term care by 4.7% of GDP by 2060. Measures to ensure the sustainability of Japan’s social insurance programmes, as spending rises and the number of working-age persons falls from 2.0 per elderly to 1.3 by 2050, is a priority. Output growth is projected to continue at a moderate pace Output growth has slowed since 2017, reflecting weaker exports as world trade decelerated. Still, output growth is expected to remain close to ¾ per cent through 2020, as shortages of labour and capacity, combined with record-high profits, continue to support business investment and wages. The temporary effect of the planned hike in the consumption tax rate from 8% to 10% in October 2019 will be less than after the 2014 tax hike thanks to offsetting fiscal measures. The Bank of Japan should maintain monetary easing until achieving its inflation target while taking account of risks and problems. Headline consumer price inflation has edged up from negative territory in 2016, but remains well below the 2% target. Under qualitative and quantitative easing, the central bank’s holdings of government bonds have reached 85% of GDP (Figure D). Global uncertainties weigh on the outlook. Trade tensions have clouded the outlook for businesses and risk disrupting investment and global value chains. Japan is also vulnerable to a slowdown in China’s domestic demand. On the domestic side, wage growth is a major uncertainty. Larger increases in basic wages are important to sustain private consumption. General government fiscal balance (% of GDP) 1. Excluding the impact of the 2019 tax hike. Source: OECD Economic Outlook database. 1. March 2019 for Japan, January for the United States and November 2018 for Sweden. Source: OECD Economic Outlook database. 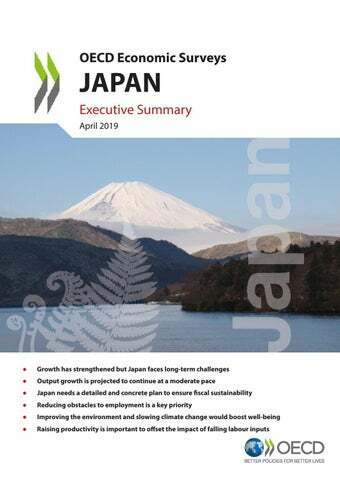 Japan needs a detailed and concrete plan to ensure fiscal sustainability The government now aims to achieve a primary surplus by FY 2025.
facing depopulation. Efficiency would be increased by expanding the joint provision of local public services, including health and long-term care and infrastructure, across jurisdictions and developing compact cities. Japan should rely primarily on the consumption tax to boost revenue as it is a relatively stable revenue source, is less harmful for growth and improves intergenerational equity. The current 8% rate is one of the lowest in the OECD. 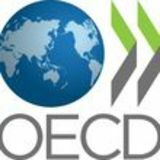 Achieving a sufficient primary surplus through the consumption tax alone would require raising the rate to between 20% and 26%, above the 19% OECD average. A hike in environmentally-related taxes from their relatively low level would also be beneficial. In addition, broadening the personal income tax base would raise revenue while reducing inequality and disincentives to work. Policies that encourage employment and output growth are crucial for fiscal sustainability. policies to: i) improve work-life balance by strictly enforcing the new 360-hour annual limit on overtime; ii) further reduce waiting lists for childcare; and iii) attack discrimination, which tends to exclude women from fast-track career paths. Breaking down labour market dualism is also essential, as women account for two-thirds of non-regular workers, who are paid substantially less. This would also eliminate a key source of income inequality and poverty. It is essential to increase the role of foreign workers. The new residency status that allows lower-skilled foreigners to work in sectors facing labour shortages is a major step in this direction. Improving the environment and slowing climate change would boost well-being Japan faces the challenge of reducing CO2 emissions and air pollution. Japan plans to build new and more efficient coalfired power plants. These nonetheless produce more CO2 emissions than other types of power plants. Increasing the use of renewables, which are becoming more competitive, could reduce emissions and improve air quality. This requires facilitating their entry in electricity markets. Gradually increasing effective carbon prices, while taking into account the already high price of electricity, as well as the social and economic impacts in Japan, would be an option to achieve emission reductions cost-effectively and further increase Japan’s high level of energy efficiency. Raising productivity is important to offset the impact of falling labour inputs Output per hour worked in Japan is more than a quarter below the top half of OECD countries. The government set a goal to double productivity growth to 2% by 2020. One key area for reform is corporate governance, which has the potential to encourage firms to use their large cash holdings for fixed investment and wages. In 2015, Japan introduced a Corporate Governance Code, but the changes thus far have been primarily form rather than substance. The government should closely monitor and promote the Codeâ&#x20AC;&#x2122;s implementation, notably the measures to reduce cross-shareholding and increase diversity on corporate boards. (Figure F). Narrowing the gap is essential to achieve inclusive growth. The government has scaled back credit guarantees to SMEs and the proportion of loans that is guaranteed. Further reducing support would strengthen incentives for banks to provide appropriate monitoring and for SMEs to increase productivity. Successfully implementing programmes to promote entrepreneurship and reduce the use of personal guarantees would boost the creation of innovative firms. The large share of older SME owners creates succession issues but also opportunities to achieve economies of scale. Japanâ&#x20AC;&#x2122;s current economic expansion is its longest of the post-war era, with per capita output growth nearly matching the OECD area since 2012. However, the expansion has peaked and global uncertainties weigh on the outlook. Growth is projected to continue at a moderate rate, supported by expansionary monetary policies and fiscal measures to offset the 2019 consumption tax rate hike. Notwithstanding rising female participation, labour shortages are intensifying, reflecting Japanâ&#x20AC;&#x2122;s shrinking and ageing population, thus underlining the importance of labour market reform. Traditional labour practices, such as seniority-based wages and mandatory retirement, are poorly suited to the era of 100-year lives. Comprehensive reforms, including abolishing the right of firms to set mandatory retirement and removing obstacles to female employment, are essential. Population ageing also puts further upward pressure on public social spending and government debt, which relative to GDP is already the highest ever recorded in the OECD area. Japan needs a comprehensive fiscal consolidation plan covering specific spending cuts and revenue increases to ensure fiscal sustainability. It is essential to contain the rise in health and long-term care spending, while expanding the joint provision of local public services across jurisdictions and developing compact cities in the context of depopulation.